Dedicated coverage of new watches no matter the style, brand, or price! We aren't one of the fastest growing watch blogs for no reason. Come join us in our journey as we become one of the most widely read watch blogs out there. Tudor-Passion - www.Tudor-Passion.com is a online community for German Speaking enthusiasts of Tudor & Rolex watches. You will find news, reviews and a lot of informations abaut Tudor and Rolex. 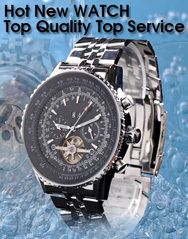 Best Automatic Watches - We have always enjoyed shopping for watches because we love them. In the end, we really like automatic watches the most. We decided to create a website to showcase the best automatic watches that we find. Blog Of Jewelry shop Parravicini - In this blog you will find regarding information and innovationes the best marks than orologeria.